How is ClearCorrect Different from Metal Braces? ClearCorrect clear braces are designed to be more comfortable and flexible than metal braces. ClearCorrect clear braces are thin, custom-fitted shells of molded, durable plastic — unlike the brackets and wires metal braces use. There is nothing to irritate your mouth. ClearCorrect clear braces are very comfortable (unlike metal braces). Do ClearCorrect Clear Braces Hurt? ClearCorrect clear braces are surprisingly comfortable. However, as your teeth adjust to the new aligners you may feel pressure temporarily. This is a sign that the ClearCorrect system is working for you by gently moving your teeth into the desired position in order to achieve your dream smile. You will love not having the brackets and wires of metal braces cutting into your mouth. ClearCorrect can be used as braces for teens but it is important to note that they should not be used as braces for teens unless the teen is fully grown. If the teen is fully grown they may be able to take advantage of ClearCorrect and use them as braces for teens. Treatment length depends on how much alignment is needed for your teeth and/or your bite, i.e. the severity of your misalignment. The doctors at Prestige Dentistry can best determine how long you will need to wear your clear braces during your initial visit. If your insurance policy covers braces, ClearCorrect should also be covered in the same way as the metal braces. Do the Aligners Ever Fall Out? 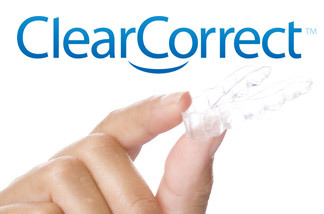 Your ClearCorrect aligners are custom-made and will fit snugly and smoothly over your teeth. Although they can be removed easily, they will not randomly fall out on their own while you are laughing at a joke or having a conversation. Prestige Dentistry is here for you to answer any other questions about ClearCorrect clear braces that you may have. Please call us today for more information or to make an appointment for your initial assessment at either of our locations in Palm Harbor or Trinity if you are in the area, including East Lake!